Since a series of conversations with Karina Holden, the director of Blue, for this blog—and deeply unimpressed by the feckless rhetoric flung about by Australian politicians, on both sides of the house, in support of the behemoth that is the proposed Adani Coal Mine—climate change has become a raging hornet in my head. I know I am not alone. It’s one thing to have read the science, including how denial about climate change works, accept climate change is happening, and quite another to be viscerally seized by the stark reality of its consequences and feel like an idiot for worrying about anything else but this. There are reasons to be optimistic and not submit to the grim fear that we are lackadaisically poised for self destruction and hell yeah, I’m looking for signs that we are moving in the right direction but we are not. The fact remains that a united global effort is required and Australia, for its part, is failing dismally. SPOILER ALERT: Australia has no bi–partisan, long–term, credible climate change policy at a time when we, and the rest of world, have never been more threatened by the actuality of climate events. It’s predicted that Australia will not reach its current Paris climate change commitments to reduce emissions between 26 and 28 per cent by 2030. And then there’s the rest. 98% of the world’s scientists believe human activity is causing climate change through the mining and burning of fossil fuels (coal, oil, gas), in turn driving the frightening increase in greenhouse gases, which warm the Earth’s atmosphere. With that comes: extreme weather (Cyclone Debbie), endangerment of ecosystems and water security, the warming of oceans and subsequent bleaching of coral reefs, infectious diseases, famine and a threat to national security (war). It’s not some lefty greenie conspiracy—even the US military consider climate change a “threat multiplier” for conflict and believe Australia is neither prepared, nor taking the opportunity in the Asia Pacific region to lead the way. FACT: According to the National Greenhouse & Energy Reporting Scheme Australia’s overall carbon emissions are up (as a result of coal-fired power) 3.4% compared with 2014-15, and up 7.5% since abolition of the ‘carbon tax’ (that was never a tax) aimed at cutting emissions in June 2004. Our emissions are estimated to be greater at the end of this decade than they were in 2000. FACT: The State of Australia’s Environment report, tabled in parliament in March 2017, by the Federal Government, has revealed that the consequences of climate change are increasing and could be irreversible. FACT: Two members (Economics Professor John Quiggan, University of Queensland) and Danny Price, Economist and leading expert in energy economics) of the Government’s own Climate Change Authority resigned. The government’s refusal to accept the advice of its own Authority, despite wide support for that advice from business, environmental groups and the community as a whole, reflects the comprehensive failure of its policies on energy and the environment. Butcher: How is this weather? Me: I hate it, Sydney has become Singapore—which is not what I signed on to living here. It’s climate change. Me: Do you believe, for the sake of argument, that the world is flat? Me: Do you believe in climate change? Butcher: Yes… but not everyone does. One February summer afternoon, overwhelmed by searing temperatures combined with 100% humidity, ‘cabin fever’ (usually associated with weather so ferociously cold that berserk behaviour sets in when trapped inside) took hold… but this was heat and it was something else. Heat had never put me off doing what I wanted to do, despite being genetically designed for Scotland. 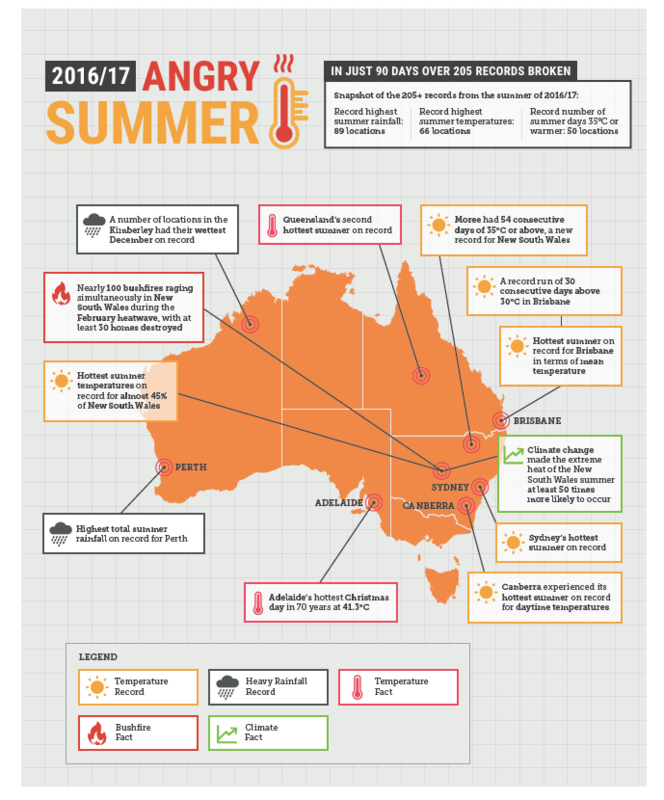 I spent my early childhood in Western Australia where, without sun-screen, we fried our faces and would bust blood blisters on the soles of our feet so we could run bare-foot and pain-free, on hot, melting asphalt and across prickle-infested verges… It’s not like I haven’t experienced hot summers. This day, as is the daily habit—not mine but that of the man I live with—I checked the BOM weather map on my iPhone; the image was a vision of swirling red, yellow and orange: Australia looked like it was on fire because it was. Source: the independent Climate Council (established after the Climate Commission was abolished. Thousands of Australians chipped in to Australia’s biggest crowd-funding campaign). I headed for a park by Sydney harbour, one I go to most days because it’s walking distance from my inner city home and a sublime break from urban intensity—green open spaces, trees, water, all manner of people, dogs, wild native birds, the odd cat on a leash, fish that jump, and visiting fairy penguins all of which co-exist—the mood is always gently joyous, even on grey days. This day, the park was spookily empty. On any other weekend at 5pm, there would have been several packs of 20-30 somethings picnicking, dog-walkers, teenagers playing football, toddlers making a run for it as their parents try to catch them and bundle them home, the odd crazy white person still sunbathing while looking overly tan… But it was evidently too hot to venture out. Those who had were either standing still or taking it very slow—stunned like the cockatoos untypically silent and the flighty lorikeets barely shifting in the trees. In 2011, I saw Melancholia in a grimy Paris cinema, close to the Sorbonne and with an audience who, like me, takes the subject—the end of the world—in their nervous stride. (My love not so much but then he’s allergic to dark films and prefers anything Will Ferrel). Written and directed by Lars Von Trier, this story is more psychology than special effects. The main characters are two sisters—one seemingly conventionally well-adjusted (Charlotte Gainsbourg doing demure and well meaning): she’s married and lives on an estate with her husband and young son; the other sister (Kirsten Dunst at her sly and sceptical best) sleeps with another man (not husband) at her own wedding, is depressive and not given to being nice to people or horses (there’s a whipping scene). Outside the drama of family relationships, there’s a sci-fi storyline running about a rogue planet—‘Melancholia’—that has emerged from behind the sun and threatens to collide with earth. Then, the vast fiery mass that is the rogue planet ‘Melancholia’ roars up ferociously behind them and they are all blown off the face of the earth. 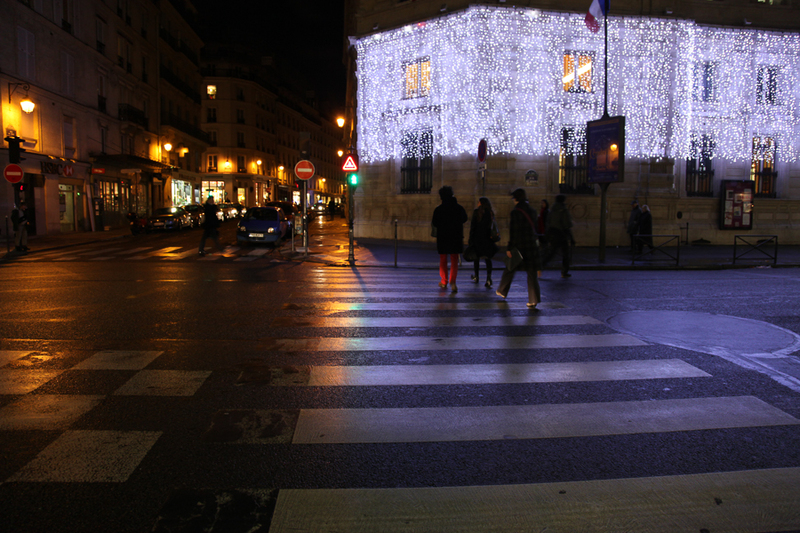 After Melancholia, we exited the cinema and stepped out into a very cold Paris winter’s night—I took in the details as one does when alert to the possibility of not existing: Christmas lights like fireflies adorning grand facades, lovers folded into bulky coats; café windows misted by the warmth of human breath. We walked home past the Cluny museum, which houses the medieval treasures of Paris and has survived revolutions and two world wars, across the Seine via an ancient bridge which has been re-built many times, past the gothic beauty and gargoyles of Notre Dame and through the imposing and battered 17th century back door of our building opposite the Shoah museum in the Marais (where it’s impossible not to notice that the list of victim’s names inside the building far out-stretch the external wall naming the ‘righteous’). 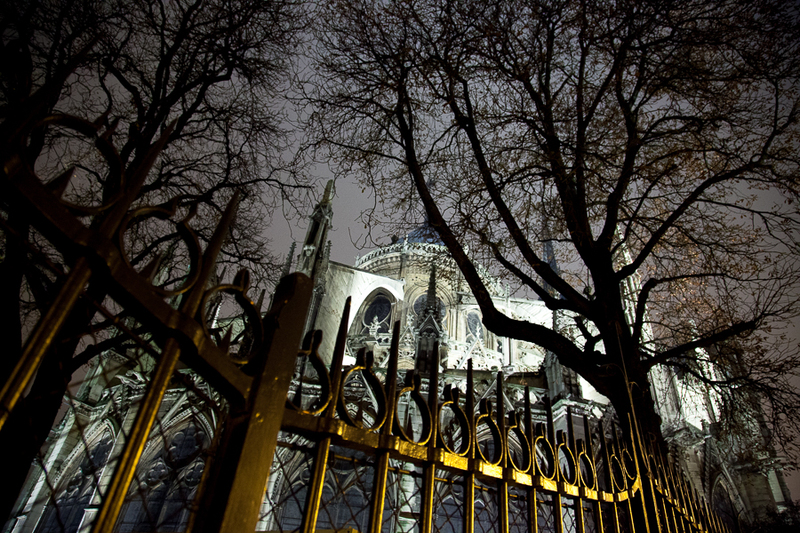 There’s no escaping the palimpsest of history and humanity’s past crimes in a city like Paris. In Australia, it’s not the same, escaping we do well. Act 3: What’s Wrong with Us? I hadn’t thought about Melancholia or that winter’s night until the ‘angry summer’ of 2016/2017, and the strange light that triggered my memory. Melancholia is about depression, not climate change but It made me think of something else: Australia’s disconnect as represented by our dangerous drift on doing sweet nothing about climate change. We are NOT going bravely forward into this new century. We are slow and apathetic, leaderless and on the wrong side of history or as Mike Sandiford, Professor of Earth Sciences, University of Melbourne put it when asked about Australian politicians on climate policy, we are “swaggering like a drunken sailor”. 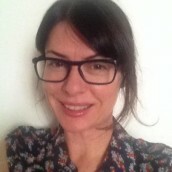 Us non-Indigenous Australians have barely come to terms with the negative consequences of our colonial history, the reality of Indigenous experience and deep knowledge, or the land—whose value and beauty often elude us but we exploit mercilessly and fail to care for, even when those actions threaten to cause serious harm, and that land is the source of our great wealth and well–being. I can’t imagine the French bulldozing the Louvre or the Cluny Museum because there was coal to be dug, or negligently trashing centuries of art and artefacts to achieve a short term political, or profit-driven business goal by an individual with a private or publicly listed company for whom lobbying works. The French not only understand the value of culture, connection and history, they’re not commercial schmucks either—those places and what they house within them, are one of the main reasons people visit and spend money in their country. They understand why it’s necessary to take very good care of their cities and countryside. We might not have the Louvre or the Cluny Museum, but this is an ancient land and much of Australia’s extraordinary treasures are in nature: the Great Barrier Reef, Kakadu, Uluru National Park, the Daintree…We are a country home to the first songbirds in the world (lyrebirds, parrots)—intelligent birds that evolved 1 million years before intelligent apes. 70% of our mammals, birds, reptiles and frogs, about two-thirds of insects and 86% of plants are found nowhere else on the planet but we have one of the worst extinction and decline records in the world. We continue to log forests for cheap paper products, destroying the habitats of our unique creatures like the endangered Leadbeater’s Possum, Swift Parrot and Carnaby’s Black Cockatoo. Cutting down trees pumps more carbon dioxide into the atmosphere; planting significantly more trees would contribute to the arresting of climate change. (And there’s many jobs—the 4 letter word with the greatest rhetorical thump worn thin by politicians currently—in looking after national parks and and growing trees but that doesn’t get much airplay). 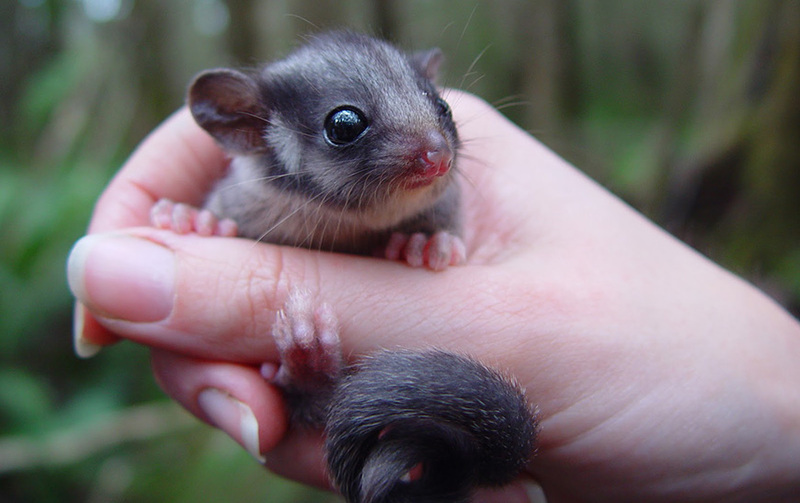 A Leadbeater’s possum. Photo by Dan Harley. Last month, to the dismay of climate scientists around the world, Australia’s federally financed science agency — the Commonwealth Scientific and Industrial Research Organisation, or CSIRO — announced plans to shift its focus to commercially viable projects and cut or reassign 350 researchers. The decision, as more than 3,000 climate scientists have declared in an open letter to the Australian government, demonstrates a deplorable misunderstanding of the importance of basic research into what is arguably the greatest challenge facing the planet. This clearly gave the federal government a pause—because ‘new money’ for climate change research was soon announced however this didn’t get close to restoring the savage and short-sighted cuts to jobs and investment in climate science at the CSIRO. It’s truly shameful—especially as the CSIRO has long been, internationally, one of the most respected agencies in the scientific world (and paid for by generations of tax payers). In 2017, more bleaching had occurred. 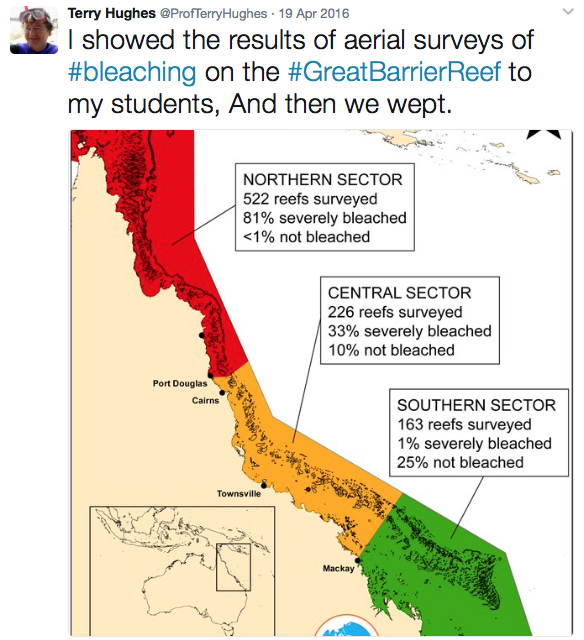 The combined impact of this back-to-back bleaching stretches for 1,500 km (900 miles), leaving only the southern third unscathed…Clearly the reef is struggling with multiple impacts,” explains Professor Hughes… “Without a doubt the most pressing of these is global warming. As temperatures continue to rise the corals will experience more and more of these events: 1°C of warming so far has already caused four events in the past 19 years…Ultimately, we need to cut carbon emissions, and the window to do so is rapidly closing. ACT 4: Why No Leadership? Why when 77% of Australians believe in climate change do we not have policy that deals with climate change? A Guardian Essential poll taken April 4, 2017, shows that of the total number surveyed, 51% support an Emissions Trading Scheme (ETS) in the electricity sector—but that doesn’t translate into policies or action. Another poll by the Australia Institute, found two-thirds of voters and 55% who identified as coalition voters believe Australia is moving too slowly on renewables. Why do the mainstream media (including the ABC), and why do we, settle for the constant use of the PR-invented term ‘clean coal’ when there’s no such thing? Why when the proposed Adani Coal Mine is viewed by the market as a possible ‘stranded asset’ and the economic indicators are all about renewables as the job creators and revenue-earners of the future, is the Federal Government pushing ahead, and offering the company a $1 billion loan (tax payers money) to build the infrastructure that Adani has been unable to raise from the private sector? The Australian Labor Party is also a supporter of the proposed mine, and the Queensland Government has not only been pushing hard for the Adani Mine but also offering Adani unlimited access to groundwater, which farmers legitimately fear would drain the Great Artesian Basin. All this, despite the fact that there are, at most, 1500 jobs on offer now (including indirect jobs) but the plan is for the mine to be manned by robots. With the Adani Mine would come 4.7 billion tonnes of carbon emissions that ultimately threaten the 70,000 jobs the great Great Barrier Reef supports, not to forget the $1 billion in tourist dollars, per year, to the state of Queensland. There’s been so much written about the Adani Coal Mine, but of all the pieces I’ve read, this one cuts through. Research just released shows that to avoid dangerous climate change, we need anthropogenic emissions to halve every decade. Building the biggest coal mine in history, when there is already a global glut and sufficient investment to tip us over the edge, is not what responsible conservative governments should be doing. They should be conserving all that is precious to us. Serving us. Instead, they are preparing to betray us… If the world in 2077 is still burning as much coal as we are today, and the financial model of the Adani assumes it will, Australia as we know it – our wheatbelts, our reefs, our cities, and our lifestyles – will cease to exist. What more do we need to know? The lack of leadership on climate change is hard to forgive. Harder to forgive is ourselves. Why do we put up with this?